As stamp collecting has been a popular global hobby, philatelists around the world are very much intrigued as to what are the rare stamps of the world. Of course, any philatelist would love to buy rare stamps, if only they have the resources to acquire such. Stamp collecting value is actually based on the rarity, value, and fame of stamps. For budding stamp collectors out there, here is a little background information on some of the famous, rare, and valuable stamps. Issued in Great Britain on May 1, 1840 and was officially used on May 6 of the same year, the Penny Black has been known as the world’s first adhesive postal stamp used in a public postal system. It features a portrait of the young Queen Victoria, and was printed using the line-engraved printing method, reproduced on large sheets with 240 stamps per sheet. Though it was in use for just over a year, it remains today as one of the world’s most enduringly popular stamps and has been recognized as a design icon. 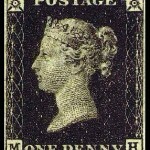 The Penny Black’s value is noted as between $240 and $3000, depending on its condition. Designed by Swiss architect Melchior Berri, the Bassel Dove was issued on July 1, 1845 by the Swiss Canton of Basel ((member state of the federal state of Switzerland). It is the world’s first tri-color stamp printed in black, crimson, and blue. 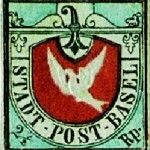 It featured a white dove embossed on a field of red with a letter in its beak, and inscribed with “STADT POST BASEL.” In its top center depicted a Bishop’s crosier (Basel Coat of Arms). With an estimated value of $115,000, the Perot Provisional is the first printed stamp of Bermuda. 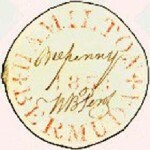 The story behind this famous stamp traces back in 1848 when it was issued by Bermudians to inaugurate their capital, Hamilton bearing the signature of the then Bermuda postmaster, William Bennet Perot. It has been known that only 11 copies of this stamp have been discovered with most of them in the possession of the European royalty, including the specimen belonging to Queen Elizabeth II. Being part of a series of three definitive stamps, the British Guiana 1¢ magenta was issued in 1856 and was intended to be used for local newspapers. Widely regarded as the world’s famous stamp, it was imprinted in black on magenta paper. It features a simple design—a sailboat at the center of this octagonal stamp with a 4¢ denomination. It also has the British colony’s motto “DamusPetimusQueVicissim” (We give and expect in return) in the middle. It has been documented that in 1875, a 12-year-old boy named L. Vernon Vaughnan discovered the specimen of the stamp with 1¢ inscribed instead of 4¢. Although several counterfeits have been discovered over the years, one single authentic copy exists and believed to have been kept in a bank vault in Philadelphia while its owner, the US chemical fortune heir, John E. Du Pont, was in prison for a supposed-to-be 30-year sentence for a murder case against an Olympic wrestler. It is presumed that the stamp is still there even though its owner died while still imprisoned. Now you that you know some of world-famous rare and valuable stamps, isn’t it exciting to know where to buy stamps to add in your collection?